Join us for an exclusive briefing by Kate Dischino, Director of Emergency Programs with AmeriCares. AmeriCares is a health-focused nonprofit that has been helping people affected by poverty or disaster for over 35 years, including survivors of Ebola, cholera and other epidemics. Kate Dischino, director of emergency programs at AmeriCares, is on the front lines of disease outbreaks and natural disasters, often deploying to crisis zones on a moment’s notice to lead field teams, coordinate aid deliveries and implement emergency programs that save lives. Kate will discuss the origin of Zika and the current state of the crisis, what is being done to reduce the impact of the virus and how AmeriCares is confronting the outbreak in Latin America. 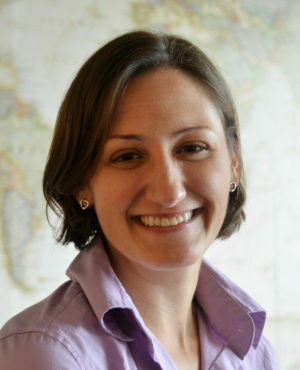 As director of emergency programs, Kate oversees AmeriCares responses to domestic and international emergencies. She is often deployed to disaster zones on a moment’s notice to lead field teams, coordinate aid deliveries and implement emergency programs that meet survivors’ health needs. Since joining AmeriCares in 2012, Kate has been on the frontlines of dozens of emergencies including Hurricane Sandy (2012), the 2013 Oklahoma tornadoes, Typhoon Haiyan in the Philippines (2013) and the Nepal earthquake (2015). A certified emergency manager, she plays a pivotal role in the design of AmeriCares emergency programs including a psychosocial workshop for frontline health workers responding to emergencies and a training program for pediatricians treating children affected by disasters. In 2015, Kate oversaw the creation of AmeriCares first disaster preparedness guide for free and charitable clinics to help ensure safety net health facilities can continue operating during emergencies. Kate’s disaster response work with AmeriCares has taken her to Fiji, Mexico, Nepal, the Philippines, Saipan, Vanuatu, and all across the United States. A leader in the emergency response field, Kate currently serves on the Board of Directors of the National Voluntary Organizations Active in Disasters where she is a member of the Executive Committee and chairman of the Disaster Health Committee. She also participated in the development of the 2014 National Health Security Preparedness Index as a subject matter expert. Prior to joining AmeriCares, Kate served as the associate director of Save the Children’s Domestic Emergencies Unit where she built partnerships and strengthened the emergency management program. She earned a master’s degree in international administration from the University of Denver and a bachelor’s degree in international studies and Spanish from Muhlenberg College. 600 Congress Avenue 15th Floor, Austin, 78701, United States.